John Carpenter, after a few years of relative silence, is back in current movie news thanks to a recent concert tour and the report that he’s once again associated with the Halloween franchise for the first time since producing Halloween III: Season of the Witch in 1983. Although we don’t know if Carpenter plans to get back in the director’s chair at some point, all this is still a reason to celebrate the career of a Titan of Genre, a global treasure and gift to science-fiction, horror, suspense, and action-movie lovers everywhere. Today I’m inaugurating a feature-by-feature look at Carpenter’s eighteen theatrical feature films. We begin at the beginning: Carpenter’s USC student film that billowed into an accidental theatrical release — Dark Star, the Spaced-Out Spaceship. The spacecraft Dark Star drifts through the twentieth year of its apparently infinite mission. The four crew members — accompanied by the cryogenically frozen body of the captain — use intelligent bombs to blow up unstable planets to clear the way for eventual colonization. And, hoo boy, has the crew gotten bored. 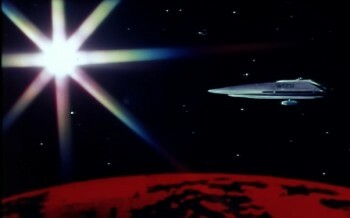 Talby (Dre Phaich, voiced by Carpenter) retreats to contemplating the stars through the ship’s dome; Pinback (Dan O’Bannon) tries to rally the crew by pestering them; Boiler (Karl Kuniholm) is into trimming his mustache and punching Pinback in the arm when nobody’s looking; and acting commander Doolittle (Brian Narelle) jams on homemade musical instruments and ponders the waves he left behind at Malibu. Pinback lets an alien captive loose on the ship and screws around with it. A bomb in the cargo bay refuses to disarm itself, Doolittle tries to stop it with a philosophical argument based on Edmund Husserl, Talby flies out the airlock, Boiler almost shoots Pinback in the head, and everyone dies when the bomb develops a god complex and detonates in the cargo bay anyway. John Carpenter went on to make eighteen more films, so apparently all this worked like a charm. Although its status as a “John Carpenter film” is a touch wobbly (more about this later), Dark Star is an interesting place to launch a career and a fresh experience when examined through the lens of an ultra-inexpensive student film that outgrew its format. And when it plays before the right crowd, Dark Star goes off like a comedic stellar-nuclear bomb. The first time I knew anything about the existence of Dark Star came from a blurb in an entertainment magazine that described it as undercutting the Star Trek ethos by showing outer space as “a long car trip with people you used to like.” I can’t come up with a more succinct description of this odd science-fiction comedy. It’s a closer blood relation to The Big Lebowski and Swingers than to Galaxy Quest and Spaceballs, and can be classified as an early version of the “slacker comedy” genre, although the match isn’t exact. The movie floats in a haze of aimlessness and Who-Gives-a-Damn attitudes. It’s the final frontier where all good intentions of a utopian future and the business of Boldly Going have flown out a blown storage hatch along with the ship’s entire supply of toilet paper. If this deflation of science-fiction tropes of the era sounds like your kind of fun, you’re part of the crowd that Dark Star will utterly demolish. Pinback: Think we’ll ever find any real intelligent life out there? Pinback: Oh, you know. The Veil Nebula. Dark Star ’s co-writer, VFX designer, and star Dan O’Bannon would continue to have a solid career as a writer-director (Return of the Living Dead), but he also could’ve succeeded as a comedic character actor. Pinback is one of the funniest characters to appear in any Carpenter film, and O’Bannon deserves the chunk of the credit for this success. Pinback is such a bizarre creation. We find out his backstory: he’s a fuel maintenance technician named Bill Froug (a name swiped from O’Bannon’s agent and fifth-season Twilight Zone producer William Froug) who badly failed his astronaut exam. He ended up trapped on Dark Star when he was mistaken for the real Sgt. Pinback and couldn’t get the com on his starsuit to work to inform anybody differently. From the irascible and bitter man glimpsed in an early video diary entry (“Pinback’s underwear does not fit me.”) false-Pinback turns into the actual Sgt. Pinback who believes in cultivating the best crew morale possible. He attempts this by becoming “that guy” at the office: the one nobody pays attention to except to snarl at him occasionally to shut up. Almost every moment with Pinback is great, with the diary entries showing the range of his personality as the highlight. Aside from the careers of Carpenter and O’Bannon, Dark Star’s greatest gift to posterity is the extended scene of Pinback trying to corral a captive alien life form that breaks loose and terrorizes — well, irritates — the ship. This idea germinated in O’Bannon’s gray matter afterward and transformed into the script for Alien, which is essentially Dark Star done scary … and with a bit more cash available. The sequence is a gem of physical comedy, with one of the most hilarious-looking low-budget alien designs ever: a garishly painted beach ball with rubber monster gloves for feet. Bomb: I recall distinctly the detonation order. My memory is good on matters like these. Doolittle: Of course you remember it, but all you remember is merely a series of sensory impulses which you now realize have no real, definite connection with outside reality! Bomb: True. But since this is so, I have no real proof that you’re telling me all this. It’s humor aimed squarely at the SF fan, and non-fans will have turned the film off long ago anyway, so the indulgence is justified. The nihilistic comic reward is that Doolittle accidentally turns the bomb into a solipsist that makes the final leap to believing it is the First Cause. 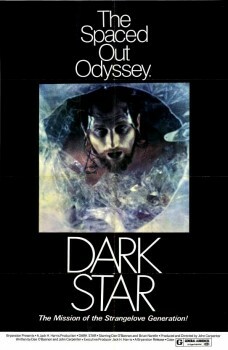 Dark Star achieves existential gloom among the comedy parts, akin to the dirge of activity seen aboard Discovery in 2001: A Space Odyssey. Talby and Doolittle do the heavy work of tugging around the hopelessness of an insular existence entombed within a spaceship. Talby views the cosmos as his eventual escape and longs to journey with the eternal Phoenix Asteroids. When he finally gets his wish, it’s the movie’s “Star Child” moment. Doolittle’s longings are more prosaic: he wants to return to Malibu and Zuma to ride the waves on his board once more. When he yearns to have his surfboard back, “even if I could just wax it once in awhile,” it’s an emotionally affecting and humorous glimpse beyond the faux-Romantic majesty of interstellar travel. As a composer, Carpenter was feeling his way here with a score that’s primarily electronic beeping and groaning noises. But the original theme song, the twangy country number “Benson, Arizona,” is a hoot. Any playlist of Carpenter’s music ought to include this. Although it isn’t actually something bad about it, Dark Star isn’t 100% a John Carpenter movie, a fact anyone analyzing it within the context of the director’s career needs to acknowledge. 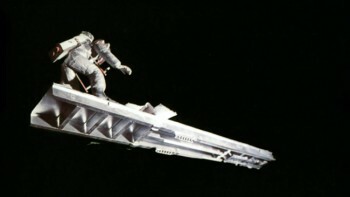 Carpenter is the film’s co-author, with Dan O’Bannon as the other name on the front cover, serving as star, co-screenwriter, producer, editor, and special effects designer. 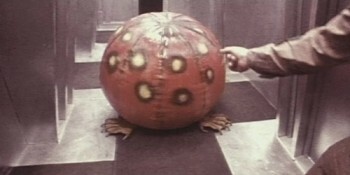 The humor of the film originates from O’Bannon’s sensibilities, making Dark Star more a sibling to Return of the Living Dead than They Live or Escape from New York. You have to start looking at John Carpenter’s career at its true beginning, but it isn’t until his next film, Assault on Precinct 13, that you sense his filmmaking soul. I guess what I’m saying is that if you’re interested in taking a friend on a tour of John Carpenter’s world, don’t begin with Dark Star. Distributor Jack Harris insisted on enlarging the original 68-minute cut (already a hefty running time for a student film) with an additional 15 minutes to pack it up to feature length for theaters. Those extra minutes don’t do the movie many favors, and Carpenter and O’Bannon have expressed their disappointment with what Harris conscripted them to do. Most of this extra footage is a chunk between the opening credits and Doolittle’s first visit to Talby. The material is filler, which isn’t necessarily a movie-killer in what’s already a loose film with rudderless characters, but it remains filler no matter what. It’s better enjoyed as a bonus feature on a disc. (The old DVD presents the movie this way; the current Blu-ray only includes the extended version). 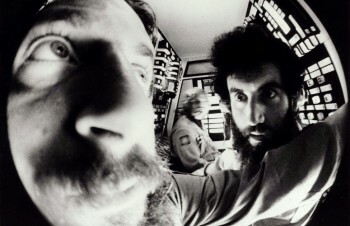 The extra footage contains an effects scene of the ship surviving a trip through an asteroid field, and there are a few laughs from a pantomime sequence in the crew’s quarters where Pinback tries to lift the spirits of the other crewmembers with a rubber chicken and googly-eye glasses. But it’s too much delay too early, when the movie needs to hustle to Pinback vs. the beachball alien as soon as possible. Dark Star deserves praise for what it achieves with almost no money at all, but there’s no avoiding that it’s simply not an attractive-looking motion picture — something all other Carpenter films are. His next feature, with only a bit more money and the same director of photography, is a vast advance in on-screen aesthetics. It makes sense that Carpenter preferred the experience of professional filmmaking on a schedule where he could keep a tighter control over the film’s look rather than navigating the haphazard shooting of a movie on 16mm over three years, squeezed in whenever it fit with everyone’s schedule and the availability of equipment and sets. Dark Star explodes, Boiler and Pinback die instantly, Talby flies off with the Phoenix Asteroids to circle the galaxy for a trillion years, and Doolittle surfs down to the planet on a piece of debris and burns up in the atmosphere. A beautiful way to die. Captain Powell may have survived … but wasn’t he already dead? Ryan Harvey is one of the original bloggers for Black Gate, starting in 2008. He received the Writers of the Future Award for his short story “An Acolyte of Black Spires,” and his stories “The Sorrowless Thief” and “Stand at Dubun-Geb” are available in the Black Gate Online Fiction library. A further Ahn-Tarqa adventure, “Farewell to Tyrn,” is currently available as an e-book. Ryan lives in Costa Mesa, California where he works as a professional writer for a marketing company. Occasionally, people ask him to talk about Godzilla in interviews. Yes, it’s a quirky little movie, but such a fun one. Very much looking forward to the other movies being covered. Worth 150 big-budget, small-brain epics like Prometheus. Excellent, Ryan! I’ve been looking forward to this article. It’s been at least a quarter century since I saw this, re-run some Sunday morning in my hometown, and I STILL remember the alien beachball sequence as friggin’ hilarious. I actually picked up the Alan Dean Foster novelization used somewhere and have it to this day. Great write-up. Yeah, it’s a ragged, sloppy film, but I love it. I’ll take it over a dozen bloated big budget sci-fi films any day of the week. I don’t know, Martin. I think my gauge of realism shifts the moment “Benson, Arizona” starts playing and then when the Beach Ball alien pops up… I think anything is on the table after that, including surfing down to a planet. This not-quite-Carpenter movie might be the one for me. I keep trying to like John Carpenter’s films, but it has rarely worked out. I used to have a rule that I would go see any movie in which the women did a significant share of the badassery. Then I saw Ghosts of Mars, and that rule died the death. Maybe two thirds or three quarters of what would have been a good movie made up maybe half of what ended up on the screen. I haven’t been able to work the enthusiasm to see a Carpenter fim since. But…alien beach ball. Okay, as long as there’s an alien beach ball, he gets another chance. @Sarah – Have you see Assault on Precinct 13? (You’ll get a full article on soon.) It’s the film you wanted Ghosts of Mars to be. And Laurie Zimmer is a great woman badass. I think it might win you over.